We offer webmaster and search engine optimization (SEO) services for small to medium size websites, including Content Management System (CMS) support for websites built with WordPress™, for full Blog and e-Commerce integration, at the most competitive prices in San Diego. 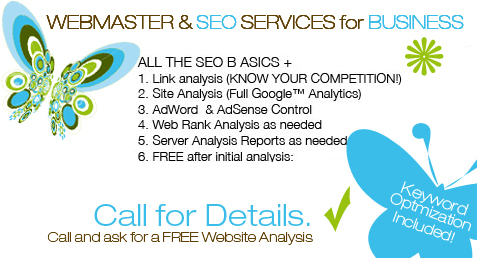 Ask for for our Website Design and Development packages. We offer Website Design and Development services. 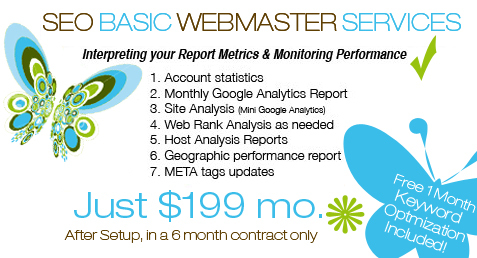 We offer webmaster services that keep everything in check. Our web hosting packages are suitable for everyone, from novices to technically advanced experts. These amazing cost effective offers are running for a limited time only!! So affordable you’ll think we are joking! 4. Robots.txt Added (Get your website indexed by the main search engines). 6. Content and Keyword Update. For those ready to take their virtual and street business to the next level. Call and save! 9. 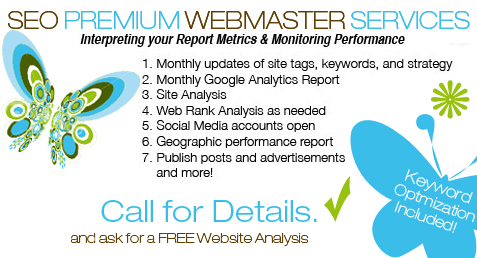 Monthly Detailed reports and More! *Image optimization in this case refers to re-sizing, applying levels, color balance, etc.